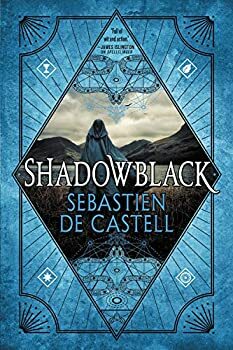 Shadowblack (2018), by Sebastien de Castell, picks up shortly after Book One, Spellslinger. Kellen, the exiled son of a Jan’Tep prince, is traveling with an Argosi named Ferius Parfax and a squirrel cat named Reichis, who will not admit that he is actually Kellen’s familiar. There is a bounty on Kellen’s head now, placed there by his people, the Jan’Tep, because Kellen showed symptoms of a demonic infestation called shadowblack. Ultimately, the demonic energy will overwhelm him and turn him evil, or at least, that’s the common wisdom. Now, traveling through the Seven Sands, Kellen, Ferius and Reichis come upon another motley crew that also contains an Argosi. Unlike Ferius, who projects a folksy, laid-back persona, this new Argosi ,who calls herself The Path of Thorn and Roses, is stern and dutiful. She is guiding a blindfolded young woman who does not immediately hit it off with Kellen. Ferius and Rosie have history, too, and it isn’t necessarily pleasant. In almost no time, Kellen is caught up in another adventure, wondering who he can trust. Seniera, the blindfolded young woman, is the daughter of the headmaster of the Academy, a prestigious school in the middle of the borderlands, called the Seven Sands. Seniera insists that the borderlands are in fact a nation, even though the belligerent bordering nations, Daroman and the lands of the Jan’Tep, among others, keep them unincorporated. Those nations still send the scions of their powerful families to the Academy. Soon Kellen discovers that Seniera appears, like him, to be infected with shadowblack. So is her younger brother. The group returns to Seniera’s city, where her father Beren is desperately searching for a cure. Shadowblack’s action takes place mostly in the city of Teleidos, and the book is filled with characters: Beren, Ferius and Rosie, and Dexan, another exiled Jan’Tep wanderer who says he has a cure for the kind of shadowblack that has infected Seniera and her brother. Dexan shows Kellen another alternative, a way of life different from servitude in his family or the way of the Argosi, and Kellen is tempted. Kellen is also dealing with his brilliant wizard sister Shalla, who reaches out to him across distances. Shalla begs him to come home, swearing that she can protect him, but apparently she didn’t know about the bounty on his head. Kellen loves his sister but he knows that her first loyalty will always be to their father. Their father does not have Kellen’s best interests at heart. While Kellen tries to figure out why the infection that Seniera and her brother is different from his, and searches for the mage who infected them, he learns more about the Argosi ways. The Argosi use playing cards in a number of ways; they create cards, they exchange cards as ways of passing information among themselves and they use metal cards with sharpened edges, like throwing stars, as weapons. There’s a lovely moment in this book when Ferius says she is going to teach Kellen to dance. He assumes this is a euphemism for fighting, but Ferius really does teach him to dance. Later, that peaceful skill comes in handy with Seniera, and later still Kellen does use those lessons in a hand to hand battle. As with Spellslinger, de Castell relies on short chapters, a cornucopia of characters and plenty of twists and turns. Kellen and Ferius have promised to help Beren and his family but there is still plenty of time for Kellen to learn both more about himself and more about his world, discovering that still more of what he was taught as a Jan’Tep is incomplete or wrong. Kellen is young, unsure of himself, bitter at the fact that his family abandoned him. When it comes to girls, he is the opposite of smooth. Still, his loyalty to Reichis and Ferius, his burning desire to keep a promise when he makes one and his basic sense of decency make him an appealing character. Kellen is forced to be something of a trickster since he can’t rely on magic, and the Argosi are, in their way, tricksters too. 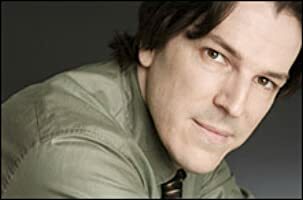 As we follow Kellen, Reichis and Ferius, we, like Kellen, see that the undercurrents aren’t coincidental. Nations are being set at each other’s throats by someone. Shadowblack is a solid second book. There is no sophomore slump here, and the lens of the story zooms out beyond Kellen’s own family and community, showing us a bigger, and complex, bigger picture. I recommend it if you like action-filled late YA with lots of banter and an underpinning of serious issues. Published in 2018. A failed mage turned outlaw must use guile and a handful of spells to challenge a dangerous rival in the second book of an exciting adventure fantasy series from Sebastien de Castell. Forced to live as an outlaw, Kellen relies on his wits and his allies to survive the unforgiving borderlands. When he meets a young woman cursed with a deadly plague, he feels compelled to help. But her secrets draw powerful enemies and it’s not long before Kellen is entangled in a conspiracy of blackmail, magic, and murder. As the bodies begin to pile up, Kellen fears he’s next. The second novel in a compelling six-book series, bursting with tricks, humor, and a whole new way to look at magic. Your review makes this book sound intriguing. I am going to read these books. Terry, you should start with SPELLSLINGER. And they may be a bit violent for you.